REC Solar, Inc. specializes in grid-tied solar electric design and installation, offering the latest technology, state of the art equipment, and financing opportunities for all commercial and residential customers. We maintain a dedicated staff of engineers, designers, and installers to make solar a turnkey solution for our customers. With a focus on quality, professionalism, and services, REC Solar has excelled to become a trusted market leader. 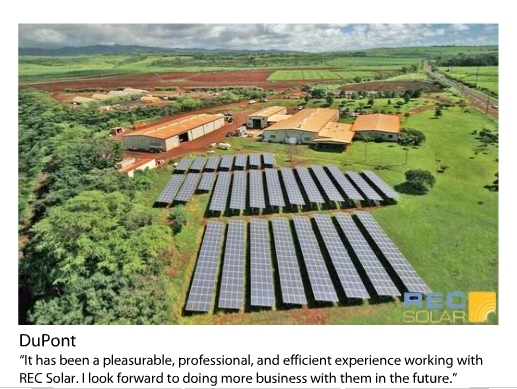 One of the United State's largest photovoltaic installation companies with several million watts of solar installed, REC Solar currently serves Arizona, California, Colorado, Hawaii, New Jersey, and Oregon residents and business owners. REC Solar hopes to encourage local and national legislation in order to make solar a practical investment opportunity in every state. Since 2006, REC Solar has been ranked by the California Energy Commission (CEC) as one of the top solar system installation companies in the state. With the recent Million Solar Roofs legislation signed into action by Governor Schwarzenegger, California has emerged as the nation’s leader in renewable energy and solar electric installations. REC Solar was founded in 1997 by Judy Ledford and Fred Sisson. REC Solar is one of only a few solar electric companies in California with engineers certified by the North American Board of Certified Energy Practitioners. Although having a national presence, REC Solar prides itself on being a local business in all of the communities where we offer solar electric systems. They currently have over 250 full time employees and we are committed to providing competitive jobs in the communities that they serve. This page was last modified 12:03, 15 February 2010.